Dry and Wet Rot are wood destroying fungi which eat into timber and weaken it significantly; this can often lead to serious structural problems making properties dangerously unstable if left unchecked. Timber decay arises as a result of severe dampness, and is potentially the most destructive agent within any building. Decay by wet rot fungi such as the cellar fungus, Coniophora puteana, tends to remain localised to the source of dampness and is restricted to the wood itself. if left unchecked it frequently causes joist ends and other bearing timbers to collapse, for examples, where the joist ends are embedded in damp masonry. Antel manufacture and supply a comprehensive range of timber preservatives to specialist professional contractors. These products have been carefully formulated and approved for use by the experienced professional to ensure maximum protection against further activity by both wood-destroying fungi and wood-boring insects. Indeed, the Antel range of wood preservatives incorporate some of the most effective fungicides and insecticides available. 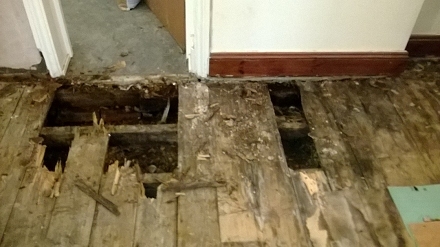 Dry Rot is particularly serious, spreading quickly, even through walls to attack timber. It needs to be dealt with quickly as dry rot makes timber weak and brittle - not good for any property! The presence of dry rot can be identified by the presence of sporophores (fruiting bodies) and these are commonly found on timber in proximity to masonry where damp conditions prevail. The fruiting body is soft in texture, fleshy pancake or bracket shaped in appearance with an ochre/orange surface and rust red coloured spores. 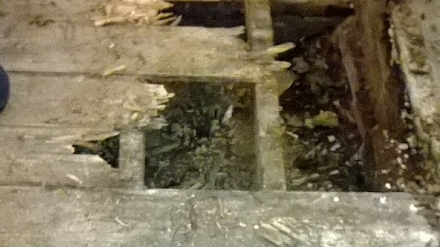 This is frequently the first sign of dry rot and infected timber generally displays a dull brown colour together with deep and cuboidal cracking (cracks appear in cube shapes) and crumbling between the fingers. It is imperative that the full extent of the dry rot is realised, the source of moisture is removed and the outbreak is eradicated. We will undertake the sterilisation of masonry, cut back/remove infected timbers and provide in-situ treatment of adjacent sound timbers. We also offer support measures such as damp proof membranes and isolating timbers from any potential sources of dampness. Treatment is carried out using the latest formulations including low odour micro emulsion preservative. This is applied to masonry and preservatives by mass irrigation in the form of paste, with gels applied to timbers. All products used are approved by the Health and Safety Executive (HSE).